Kids Connect is a children’s ministry designed with you and your child in mind! Our desire is to CONNECT with you and your child so we can CONNECT them to CHRIST and HIS CHURCH. Kids from 1 yrs old to 5th grade will experience age-appropriate and safe environments where they can learn about God and the Bible in practical and fun ways. You’ll go home with a “Parent Cue,” giving you general information of what your child learned that day and ways to bring the spiritual talk home. During both the 9am and 10:30am services, we teach the same material. So if you need to attend a different service next week, they won’t miss a beat. We teach biblical truths through storytelling, small group discussion, crafts, on-the-go activities, and music while building faith skills such as bible reading, bible memorization, prayer, and sharing our faith. Kids of all ages are taught the same story, but tailored to their age group. So if you have a child in 5th grade they learn about the same story as your preschooler or even a 2 or 3 year old, but the story learning is more detailed and in-depth for the older kids. First Time At Kids Connect? Before the Service: Once you enter the building, head to the left towards our Kids Connect area. We will meet your family and check your child(ren) into our database system. 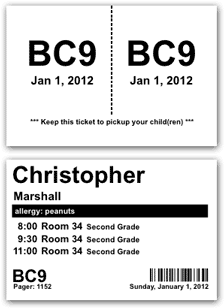 This provides a level of security**, helps us with names, and lets us know if there are any allergies. We will ask for the following personal information: family member’s names, children’s names and birth dates, family address, phone number, and any special instructions (allergies, special needs) for your child. (NOTE: we value your privacy and will not share this information with anyone). During the Service: You and your child will be given matching identification tags that are exclusive to your family and the day of your visit. You get a tag with that identification code and your child will need to wear the name tag portion with your matching identification. If for some reason your child were to need you during the service, your identification code would appear on the screens in the sanctuary. We understand that most parents of little ones keep their babies with them so Kids Connect offers environments for kids ages 1 yrs old to 5th grade in the kids wing. But we also offer a Family Viewing Room where the message is streamed in on video and you can watch the service in a more quiet and comfortable setting with your little one. It also provides an area for nursing mothers. All children’s workers have been a part of Hope Chapel for at least 6 months, are CORI’d, and always serve with at least one other adult. If you have further questions concerning our Kids Connect experience or visiting Hope Chapel with children, simply click below and get in touch with us.